It is a good idea to start dog lead training early perhaps when your puppy is about 8 weeks old. Ensure your puppy is happy wearing his collar, some breeders may have already started placing a ribbon or light collar on your puppy to get him started. Let him get used to a lead by clipping it on his collar and letting him drag it around the house for a few minutes over a couple of days, watch out he does not chew it. Next take hold of the lead and follow him around, before expecting him to follow you. Start your dog lead training with a walk around,inside your house, if your dog pulls forward change direction clockwise and walk into another room, when he walks with you, praise give treat, then progress to outside. 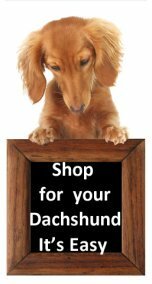 You should have no trouble getting your puppy to return to you as he knows you have treats, as his training progresses praises will be sufficient with an occasional treat. As your dog lead training progresses you need to train your dog to sit while the lead is attached to the collar or harness. If your dog sits quietly give a treat and praise, once this is established give only the praise. 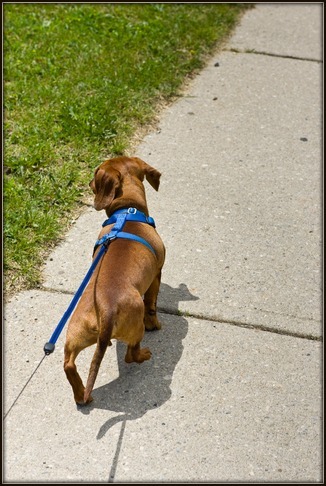 If your dachshund is leaping and pulling on the lead wanting to get going, this is not being in control just stand until he has calmed down, then start your walk. Walk around inside your house,to start with, if your dog pulls forward change direction clockwise and walk into another room, when he walks with you, praise give treat, then progress to outside. Start training with a collar and short lead to give better control and keep your puppy close to you. You have the choice of using a collar or a dog harness, which does not put pressure on the neck and spine. A good command for walking is “Let’s go” hold the lead in your right hand and any treat in you left,as well as taking up the slack of the lead, you want your dog to walk close to your left side, take several treats in your pocket. It is a good idea to start walks in your own back yard, where he is familiar and will not be over excited by a new environment. Remember if he tries to pull you or is jumping about, just stop immediately and stand until he quietens down, you may stand for several minutes, but do not move off until he is quiet, give treat and praise. When you feel you are both ready, extend your walk to another environment. When you are in the early days of dog lead training try to choose somewhere that is not too busy with people and other dogs, so your dog will stay focused on you. Give plenty of praise and a reward,when you have complete basic lead training with a short lead, you may progress to a leash that is long enough to allow your puppy to explore and play and then return to you, give rewards when he returns, to encourage him to return to you. Leads or leashes are available as retractable or extendable and in a variety of lengths up to 20 ft these allow your dog to have of freedom while still in your control and allow for exploration, but at the push of a button it takes up the slack. When your dog lead training is completed successfully it should be a pleasure to take your dog for a walk and you will both enjoy the exercise and not feel you have one arm longer than the other with a dog that pulls.